Imagine being able to walk in the shoes of the scientist and explore the lab of the quantum computer with your own eyes! With our new project, Vlab, you will be able to do so in the comfort of your own desk! 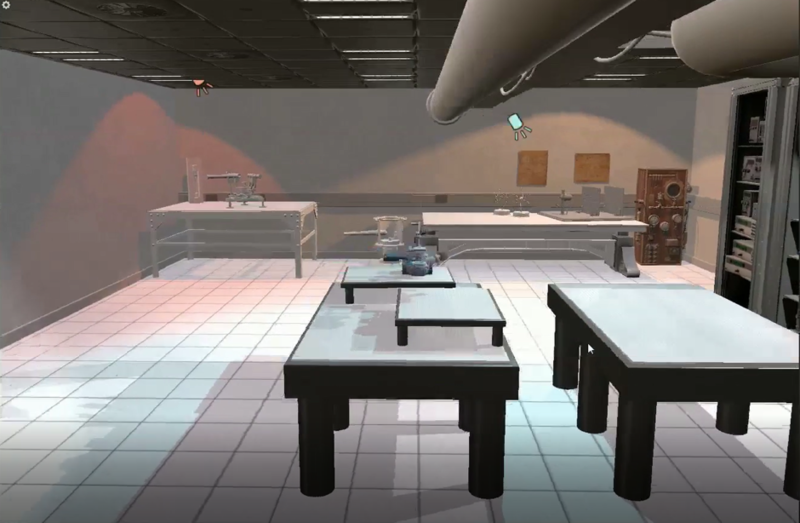 Vlab is a virtual version of our laboratory in the basement at Aarhus University. VLab will give you a full walkthrough of our experimental setup and let you interact with it. Our users will be able to open our secret draws (literally!) and learn about every equipment on the table! Here you can gain information about all the underlying physics and theories of a quantum computer. Too much too soon? Don’t worry! 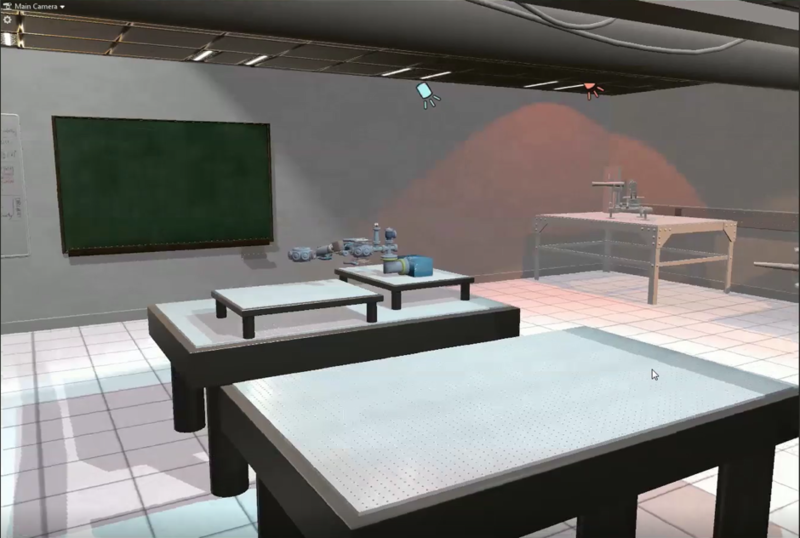 We have learning tracks designed to teach you about the fundamentals of physics as you walk through our virtual lab. What is a quantum computer and how do you build one? A normal computer uses electrical bits. A bit is usually either in the state of on or off. The time used to switch the bit sets the computational speed. The cool thing about a quantum computer is that it uses atom state as bits instead. An atom is so small that it has to obey the laws of quantum physics, which is different from your everyday laws of physics. For instance, an atom can be in both the on and off state at the same time. This phenomenon enables a quantum computer to provide a much stronger computational speed. The experimental setup for building a quantum computer is an atom manipulator. We take a billion of atoms and cool them down to the coldest temperature in the universe, -273C. When atoms are that cold, they all merge together and starts to act as one combined atom. This collection of atoms, behaving as one, is called a Bose-Einstein-Condensate (or BEC). This Bose-Einstein-Condensate is a macroscopic quantum object that we can manipulate into a quantum computer. But in order to do so, we need the BEC to be in a highly sterile environment. So we put it into a vacuum chamber, where no other atoms exist and thus disturb our BEC. To prevent the atoms of the BEC from hitting the walls of the vacuum chamber we control their motion with magnetic fields and a laser. In Vlab, we will show and guide you through the whole process of making a BEC. We will show you how we make a good vacuum, how we create the right magnetic fields for trapping atoms and how we use lasers to interact with our atoms. In Vlab, you get to create your own vacuum and design the magnetic fields, so you can trap the atoms. Why does working with atoms sound so complicated? Atoms are so small that they obey another set of physical laws than you and me. They obey the laws of quantum mechanics and are better described as batches of energy that has a certain probability of being in a specific place at the right time. In Vlab, we will guide you through all the different experiments and theories that make up the world of quantum physics. We will start off with known experimental facts, such as the color of a flame from different natural elements and the spectrum of these flames. Then, we will show you why these observations led to the Bohr theory of the hydrogen model and why the de Broglie model is equally valid. You will learn how atoms can act as particles and as waves at the same time and why Schrödingers equation is the best way to describe an atom. This is just one of the examples of the learning tracks you will be able to find in the Vlab interface. We hope that this virtual lab will become a great learning tool for young or experienced physicists, as well as, other curious minds eager to learn about the physics behind a quantum computer.